I am an artist drawn to and by the spiritual and emotive power of the natural world. There is a never ending hunger within me to synthesize powerful moments that I experience and share them with those around me. The many moods and mysteries I feel and encounter out in nature are such an overwhelming comfort to me that I can’t help but be deeply inspired by them. 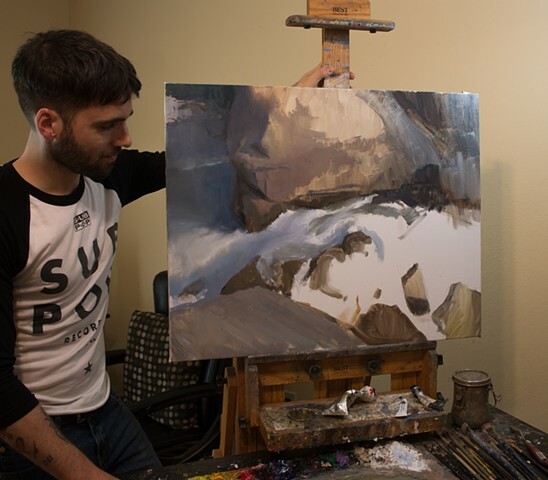 "For an artist in his early thirties, Devin Michael Roberts has managed to achieve a remarkable quality and maturity to his landscape paintings. Born in the foothills of the cascade mountain range and currently holding residence in both Washington state and the Ozark mountain area of Missouri. Roberts spends much of his time between the two areas composing scenes that evoke the feelings and memories that most impact him. 'Although I paint landscapes, I try not to think of them as documenting a specific location, in fact I blend together many different memories and references when putting together an oil or pastel painting.' 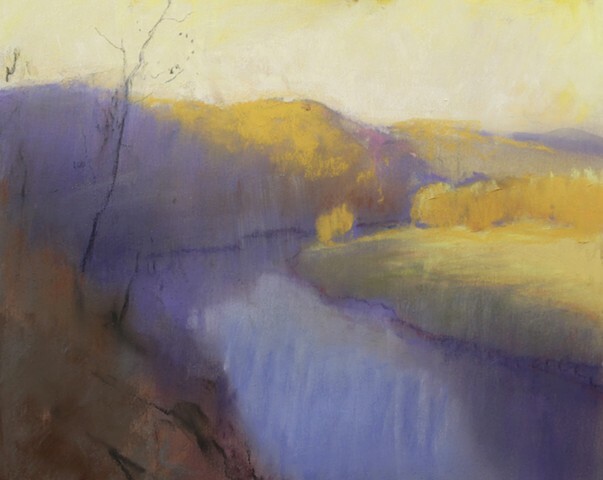 It’s through this process that Mr. Roberts builds a painting that puts an emphasis on creating an emotional connection with the viewer rather than presenting them with a rendering of a geographic location. “ I’m very drawn to low light scenes and the murky, deep emotions they can evoke. Whether it’s the moment right after the sun has dipped below the horizon, or the middle of the night. 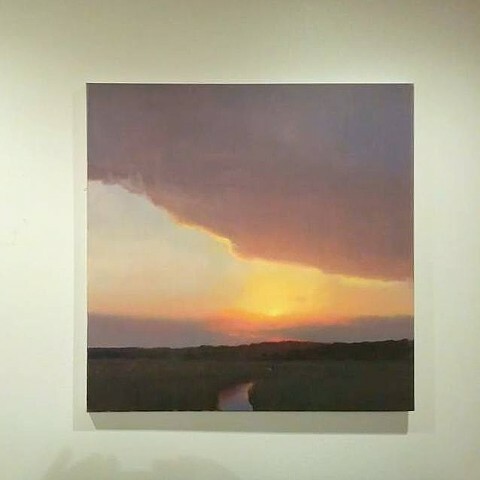 It’s these moments in my life that I feel a spiritual connection to everything around me.” Although Roberts’ paintings depict the moments in life that are most fleeting he spends large amounts of time outdoors painting directly from nature and studying the ways he can translate the scenes into imagery. 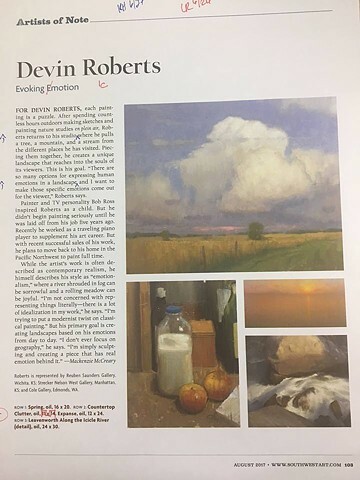 In a relatively short amount of time as a professional artist Devin has managed to build a large following of collectors, national press and awards. " 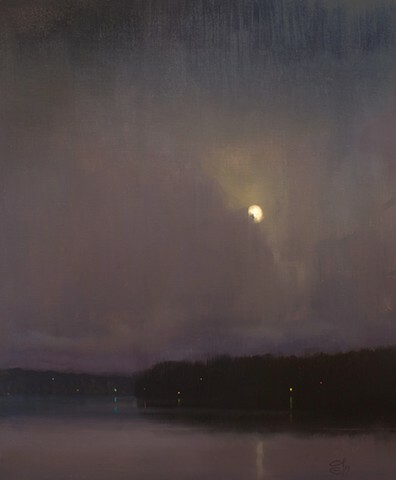 Good News: This painting titled "into the silence of night" has been accepted into the Oil Painters of America National Exhibition for 2019. It is the second year in a row that I have been accepted into this prestigious show. It's a great honor. This painting will be available to purchase through the show, to express an interest in having it held for your purchase in the show contact me. Hey everyone, I am hoping to relocate out to the Upper Rocky Mountain region, either Wyoming or Montana. If anyone has any properties to rent or knows of any opportunities that could help in this process I would be very grateful. 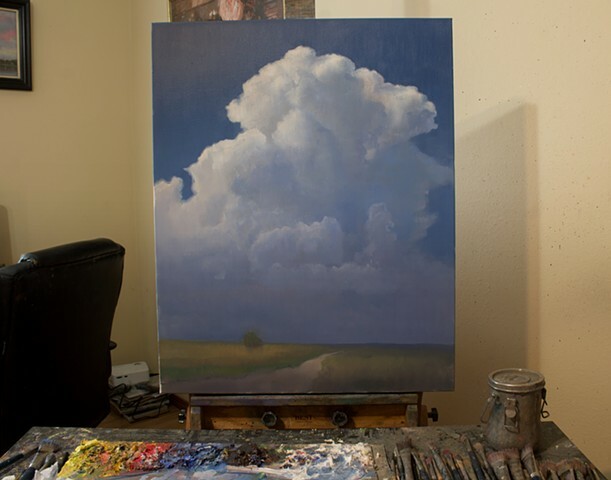 Proud to announce a very successful event at Plein Air Texas. Won first place in the miniature plein air competition titled mini pearls of the concho. Also second place in the quick draw with a pastel painting. Also had a pastel added to the permanent collection of San Angelo Museum which is perhaps the biggest honor of the event. New article on my art in American Art Collectors Upcoming November Issue. It's a small one pager but still cool! For those that do not know, I am also a pastel artist when I'm not doing Oil work. Here is a study done in pastel of an Arthur Streeton oil painting. More pastels will be added to this site over the next few months. 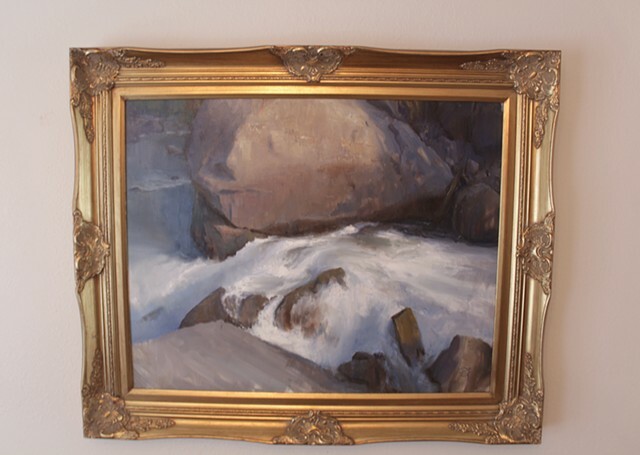 This painting titled "Along the icicle river" will show in the very prestigious Oil Painters of America National Exhibition this June and July at the Steamboat Art Museum in Steamboat Springs, Colorado. I'm very honored to have gotten in this year! Plein Air Magazine's Feb/March 2018 issue features an oil painting demonstration and feature article on my artwork. 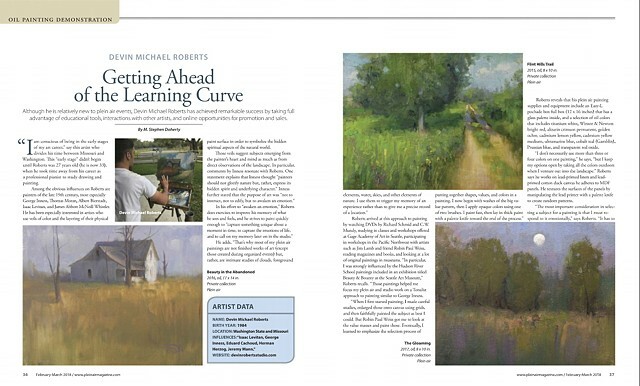 You can purchase this magazine from Barnes and Nobles or visit www.pleinairmagazine.com. The image above features the first page of the article. Hope everyone is having a good 2018 so far! Great news, my art and process will be available to view and read about in a feature article to be published in the Feb/March issue of Plein Air Magazine 2018. Be sure to pick up a copy at any Barnes and Nobles or your local book store. I will post a link to a digital version next month after the issue drops. It's been a while since I have done an update. I have been busy traveling, painting sketches outdoors and getting inspiration for new material. After spending the last few weeks in the Pacific Northwest I have finally made it back to Missouri. 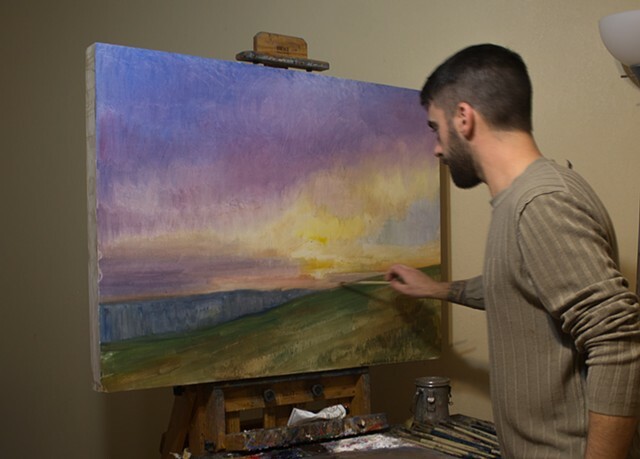 In the photo above you see myself at work on a large 30x40 inch sunset. Over the next few months I will be completing a series of large landscapes for some upcoming shows this spring and summer. Make sure you check out the "outdoor paintings" section to see some of the work I did while in the Northwest. I also have some new portrait work which will be slowly releasing over the next month or so. I also have some big news I will be sharing in Jan to kick of the new year! Stay tuned! I just got back from Sonoma and Solomons Plein Air Festivals. 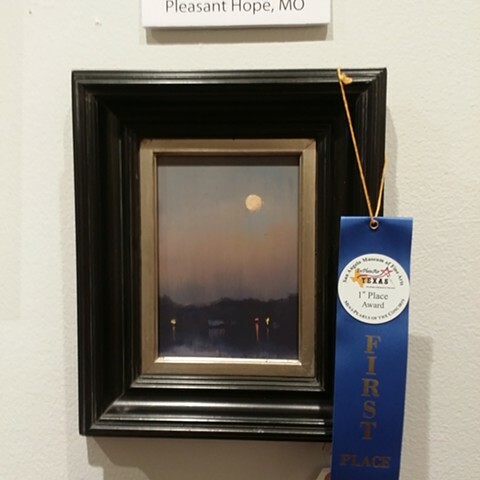 I am pleased to announce that I received a first place award in the quick draw event for a sunset that I created. A great honor when you consider the big name artists I was up against. Big thank you to judge Jason Sacran, my hosts and the wonderful Carmen and her staff from Carmens gallery in Solomons Island Maryland. You might have noticed that the "available studio paintings" section of this website has shrunk a bit. 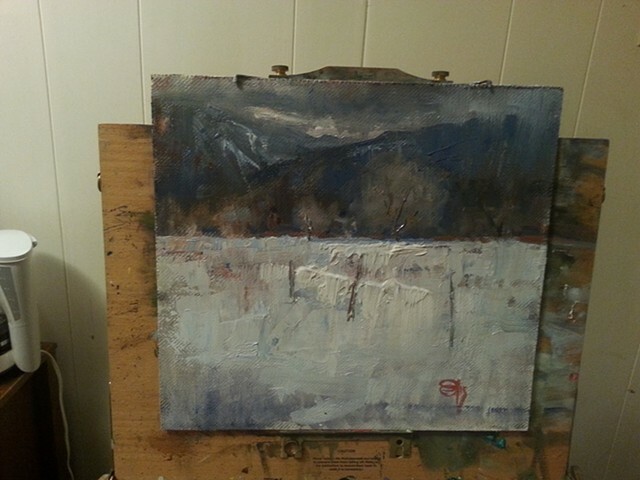 I have been busy studying outdoor painting for the last few months and haven't been in the studio as much. Typically I produce more studio work starting in October through the colder months. I use the summers to get out into nature and really study color and form. That being said I have sketches and designs for around 30 studio pieces I plan on creating over the next 6 -7 months. I will be having a feature/solo show at the Cole gallery in Washington state in May. Stay tuned and keep checking back to see updates with new paintings. 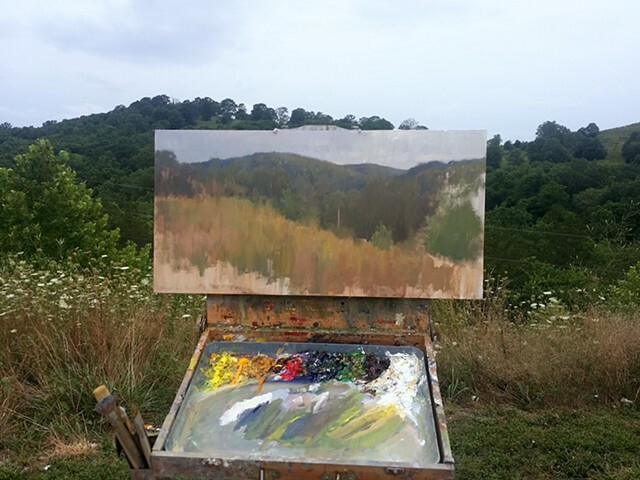 Also check out the "outdoor studies" section of this website and remember I do offer payment plans as well as most of the galleries that represent me. Just found out I won 1st place in the Plein Air Magazine Bi Monthly contest for my painting titled "Eulogy". Such a great honor. This means I will definitely be attending the salon this year in New Mexico in hopes that I have a solid crack at that grand prize in the yearly contest. 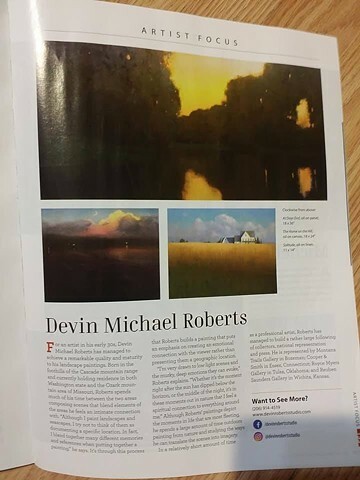 One page feature Article in Southwest Art Magazine coming out in August 2017. Check it out at any barnes and nobles or borders book store. Getting my practice in for the upcoming Plein Air Festivals in Maryland and Sonoma California in September. 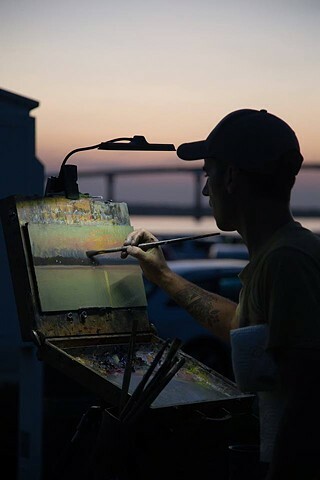 Sonoma Plein Air and Solomons Island Plein Air Festival. Both are back to back. I've just delivered a new bunch of paintings out to 3 galleries as well as an upcoming Museum show at the Vernon Filley Art Museum. To see the new work and which gallery or show it is being sold in visit my "available works" section. This is a preview of what is to come. I've been working on some subjects that you dont see me do that much and in much larger sizes than I normally work. Such a great experience down in Tequesta/Jupiter this year for the first plein air festival of the season. 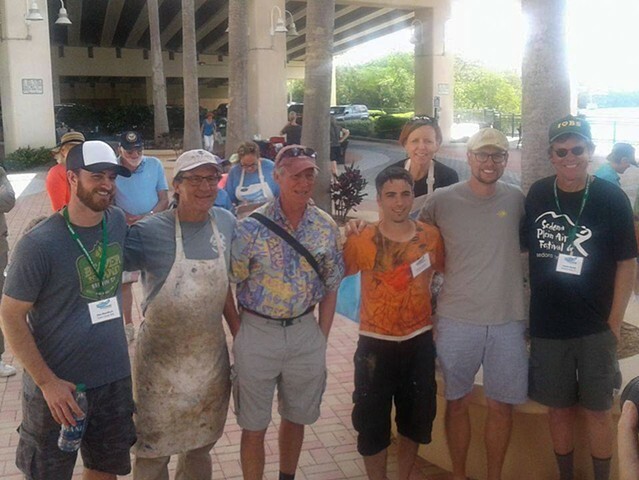 I received an honorable mention during the quick draw and got to have a photo snapped with some of the painters who have been a massive inspiration for me since day 1. Jim McVicker, Jason Sacran, Charlie Hunter, George Van Hook and Dan Mondloch. Amazing experience! I was fortunate enough to nearly sell out on paintings this time as well! More news to come soon. Check back to see if I will be painting in your city or region. 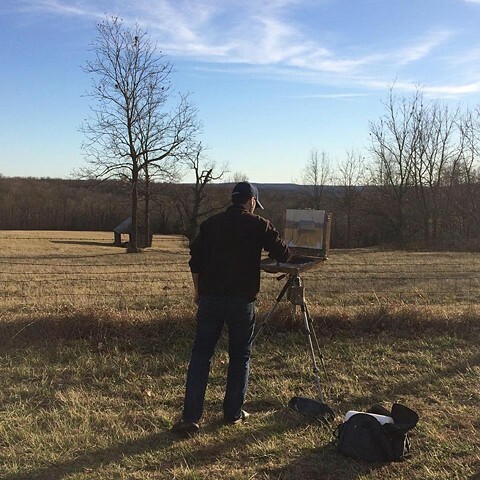 Getting some practice in for the plein air season. Join me for the Vernon Filley Art Museum Invitational on April 22nd. The show will go until mid July. Its truly an honor to be in such great company. 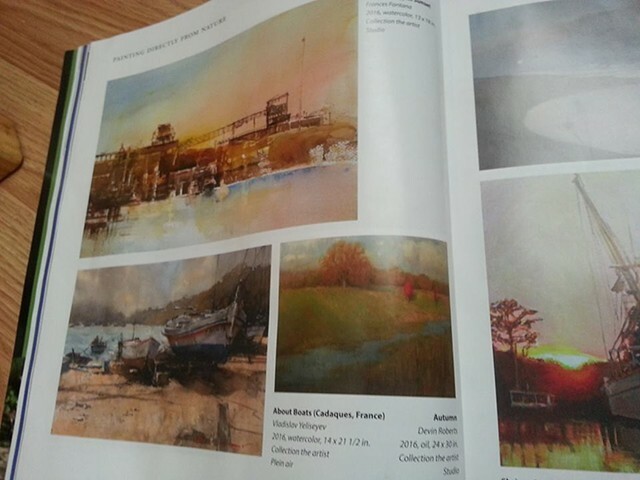 NEWS UPDATE: 10/10/2016 - Featured in Plein Air Magazine. Got a little bit of press this month. Plein Air Magazine did a feature on shorelines and included an image of the autumn themed landscape piece that I created last year. Slowly starting to get some press! 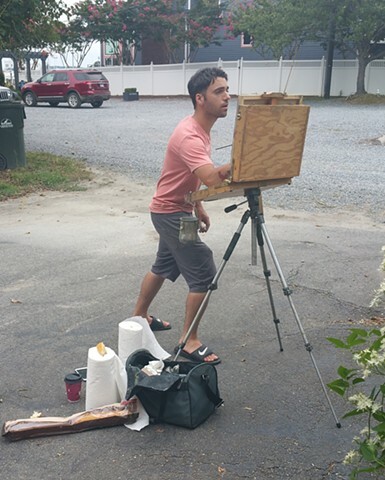 Photo from Solomons Island Plein Air Festival. I'm back home now folks and really focusing on looking for some new galleries to work with. Specifically a coastal gallery or a gallery that deals in seascapes and coastal art. If you know anyone or any galleries please contact me. Well I'm here at Solomons Plein Air Festival in Maryland. I am super excited for a week of painting with some fantastic artists. If you happen to live in the area email me and I will let you know where I will be painting so you can come and observe. We also will be having a gallery show sale at the end of the week on Saturday the 17th of September 6-8 at the Holiday Inn in Solomons Maryland. Tickets are $25 you can buy them at the door. I will post photo updates here and on my facebook. Hey folks, things were a bit quiet for me the last few months as I got settled in my new home out here in southern Missouri. I have completed a new crop of paintings that went out to the galleries and I have heard back from a few events I applied for. I will be attending Solomons Plein Air festival next month in Maryland and I will also be attending the Paint Palm Beach festival in Jupiter, FL this next march. I'm going to spend the rest of 2016 putting more of a focus on my plein air work and also my figurative/portrait work. I have finally relocated from Kansas to outside Springfield Missouri. It took a couple months to get a house and studio going again but I am proud to announce that everything is up and running. I also found out that I was accepted into the Solomons Plein Air Festival on Solomons Island, Maryland this upcoming September. Looking forward to that! Anyhow, I got an amazing amount of ideas, sketches, video, and information to work from. Probably enough to keep me busy for a full lifetime. So that being said you can look froward too, some nocturne scenes, a few sunsets, snow/ice covered river beds, mountain-scapes, some of the pueblo houses etc. Thanks again everyone for the support. Your collecting, donating etc. makes my growth possible. It's a symbiotic relationship, so whatever success I enjoy is directly because of YOU! Starting in early February 2016 you will be able to view and purchase my art in Austin, Texas through the Capital Fine art gallery. I'm very excited to be branching out into some other states. I will also be relocating to Branson, Missouri. This will not change my workshop plans for Wichita, KS. So those of you who would like to sign up for some spring workshops; it will still be an option. Awesome news to kick off the new year! I just found out that not one but two of the pieces I entered into the 10th Bicentennial Visual Arts Center Juried Exhibition got in! The paintings titled "the homestead" and " the red boat". I'm very excited about the still life getting in. I haven't really shown much of my still life or portrait work yet and look forward to doing so as I strengthen my technique and get better! Happy new year everyone! This upcoming March 9th- 13th I will be joining the countries top Plein Air Painters at the Lighthouse Plein Air Festival in Jupiter,FL. I'm very excited to be participating in this event. Been busy preparing for the upcoming group show Nov 6th at the Strecker Nelson Gallery in Manhattan, KS. I have 6 new pieces that will be featured in that show. I'm also proud to report that they have sold 75 percent of the pieces I have consigned to them so far. I've also had a record Summer and early Fall for online sales as well. GREAT NEWS! My painting titled, moonrise over puget sound has been accepted into the Oil Painters of America National Exhibition. This is a great honor for me. Thank you so much to the judges.